“Exceptional talent with virtuoso technique” writes Mike Cimballa, music critic and violinist with the Charlotte Symphony of Mr.Korbanic’s lyrical interpretations. Born and educated in Pittsburgh, He earned a masters degree in classical guitar performance from Carnegie Mellon University studying with Jim Ferla and additional study with Tom Kitka from Duquense University. 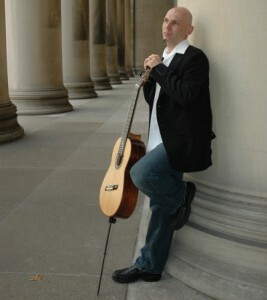 As a player on the newly innovated 8 string Brahms guitar, he has toured the east cost and mid-west. In 2006, Matthew received a grant to study with Paul Galbraith(Founder of the Brazilian Guitar Quartet and Grammy nominee). Some noted performances have been with Russ Friedman and the Rippingtons, the Three Rivers Arts Festival, the Pittsburgh Opera, Pittsburgh Arts Council,and live on WQED-FM in Pittsburgh. He has released a CD of original guitar compositions and the world premiere of Robert Maggio’s “Traveling Songs,” and is currently publishing new editions for the guitar. He has recorded with Arabesque Records.